Since I still haven't done any of my own creative work lately, I am writing this post to update you all on the big project I'm currently working on: the house we moved into about a month ago. I lost my mind a little bit two days before Christmas and invited my parents and sister and her family to stay with us for the holiday. We still had boxes everywhere when I did this, so we all had to work like dogs to get the house ready and to produce a big Christmas dinner. I made prime rib and, with Jerry's help, mashed potatoes, carrots, and buttermilk biscuits. My sister brought vegetable lasagna and we had the truffles I wrote about in my last entry. Jerry also special-ordered Esther Price chocolates from Dayton, Ohio for us, the exact same box my grandma always had out at Christmas. That was a big hit with everyone! My parents visited the week after we moved in and my mom was impressed with how different the house looks now that I have artwork up. I have been blessed in my life to grow up surrounded by art. My grandfather studied typography as a young man. He dreamed of having his own newspaper and he wanted to write the articles and design the paper and set the type himself! His six children dictated the course of his career, though, and he had to settle for selling ad spaces in a newspaper to support them all. He had two huge art books, one on graphic design, and one from The National Gallery with many color plates of the collection, and when I was very small he would get them out and we would pour over them for hours. When I went to art school he made a gift of both to me, as well as his most precious typography book. We found we shared a love for Goudy; it was the favorite typeface for us both! 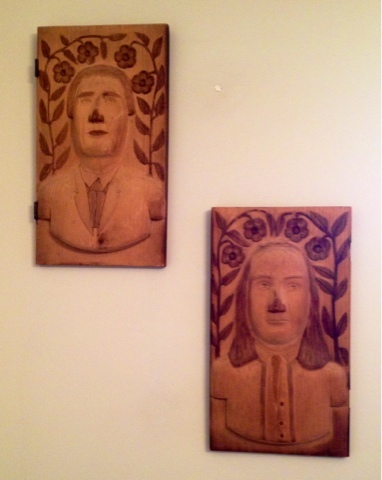 My grandfather commissioned a lot of paintings and a mural from artists in our little town, and he also inherited the carvings shown above. These are by my great-grandmother's cousin, Erling (pronounced "Elling") Brucet. 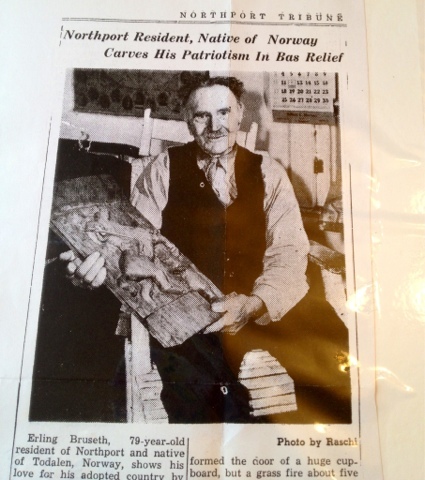 Erling was pretty typical of the "Norwegian Bachelor Farmer" of Garrison Keillor fame, except he was a wood carver. Though a native of Norway, he was very passionate about the politics of his adopted country, and this was the subject of nearly all his work. 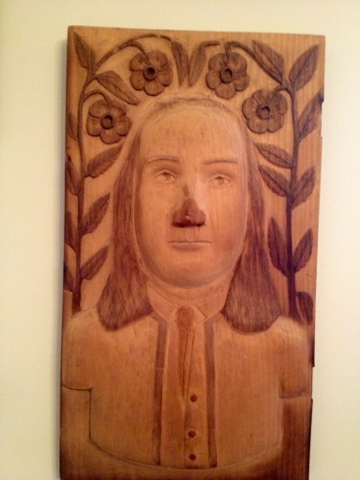 The carvings I have were inherited by my grandfather. He and each of his seven siblings inherited some work. 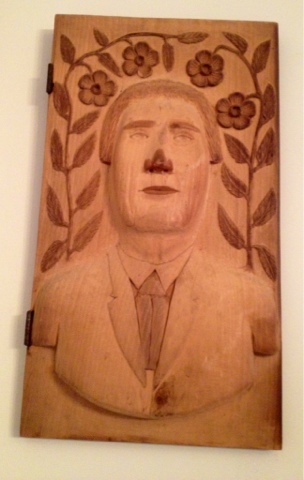 These bas relief portraits of political figures were doors which adorned a giant cupboard. Unfortunately, a grass fire caught Erling's studio on fire and much of his work burned. He risked his life to run in and remove the doors from the cabinet, which was too heavy to remove from the building. The noses of the figures were burned off. Erling sculpted new noses from wood filler, which darkened over time, and that explains why the noses are so dark. As children we always thought they'd been scorched. The portraits I have are of Benjamin Franklin and Senator Bora of Michigan, who Erling admired enough to put in the company of Franklin! My grandfather remembered Erling well and used to tell me lots of funny stories about him. Erling had no family of his own, so he spent a lot of time hanging around with his cousin, Anna Laura, Grandpa's mother. Once, Grandpa remembered, Erling was sitting in a rocking chair trying to light his pipe. It wouldn't light and he kept leaning forward trying to light it. He leaned and leaned until he fell right out of the rocking chair! Another time, Erling came to visit and left his hat behind. Great-Grandma reminded him of this the next time he came and handed his hat to him as we was leaving. Erling put it on top of the hat he wore that day. Later, he walked by a lady and went to lift his hat, only to remember another was beneath it! So, he was a funny, eccentric character, and I feel blessed to know the personality of my ancestor who died so long before I was born. Today is my father's birthday, so I need to reflect on good things that came from growing up without him. My cousin remembered and called me, so that is another good thing. My father never had a birthday cake until he got married and my mom made one for him. His parents just always celebrated it as part of Christmas. Today we've been doing a lot of laundry so we can travel back home to celebrate Christmas with Jerry's family. We are also going to see the Edvard Munch exhibit at the North Carolina Museum of Art. I am excited about that! Poor Munch was so poor he had to paint on cardboard, so we are all very lucky to still have surviving examples of his work. I haven't ever seen any of his pieces in person, so I'm beyond thrilled. We also went back to Mary Jo's to pick up the fabric for the bedroom curtains and bedding. I am really nervous, because the fabric I liked best is the most expensive I've ever bought. Mom said it isn't really bad for decor fabric, but I'm so used to doing everything on the cheap, I can't really imagine how I will cut it without being paralyzed with the fear I'll mess it up. Luckily, these are just drapes and pillows, which I've been sewing so long I could probably do it with my eyes closed. 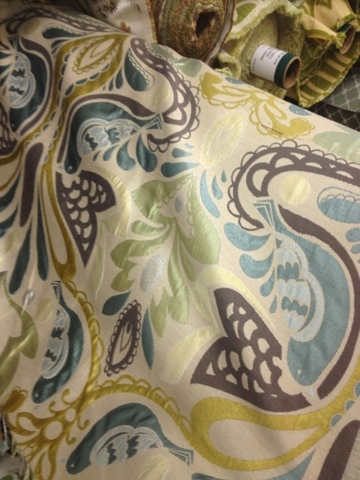 The fabric and paint I chose for the bedroom. Our contractor is supposed to start the attic conversions the first week of January, so hopefully I'll soon have a new office to work in! It will be a big change from working out of the bedroom, as I've been doing for the past few years. If I don't get around.to writing again before the 31st, then Happy New Year to you all. I hope it brings us all those things we most long to have. Today I want to wish all my readers a Merry Christmas and Happy Holiday a bit early because tomorrow my parents will be arriving to stay for Christmas and I will be busy. I have already had my nose to the grindstone to a great degree and I have finally managed to finish the two front rooms, the dining room and living room, so they are box-free with artwork hung and decorated for Christmas. The oil painting above, called La Bella Città , or "The Beautiful City" in Italian, has presided over our front room since we were married. In this house and our last that has been the dining room. 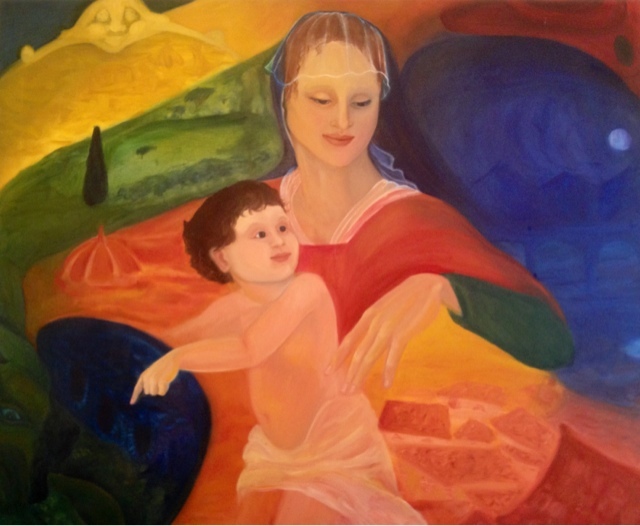 This is my homage to Italy and to the city of Firenze, painted around 1995-1997 with all the scenes I so longed for when I returned to America. This painting resulted from a color study. We were supposed to make a painting using color and resulting in a good composition with no imagery and then work it into a representational picture once we had a solid foundation. This assignment was devilish and brilliant, the brain child of the late, great Paul Hartley, a wonderful teacher and amazing artist. Learning to use color well is extremely difficult for most young artists and Professor Hartley has been the best person I have known to explain both color and composition well. 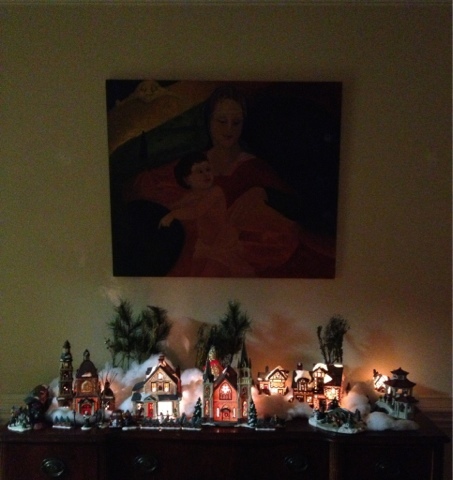 The Christmas village in the dining room. In this new house I don't know if this painting will remain on the wall. I had been hanging around in the Uffizi quite a bit during my time in Firenze and had developed a bit of an obsession with Raffaello and his intensely colored Madonnas. Also, you just can't portray Italy without strong colors. Something about the golden light there is just so different, every color seems more saturated. In the new house this painting seems too dark and bright, and it is really too small for the wall. It is perfect over my village for Christmas, though, and I don't have anything else painted for the room yet, so we went ahead and hung it up. Besides cleaning and decorating, today we finally managed to make it to church. This morning we tried the Lutheran church here in town. We looked into the Latterday Saints (Jerry is trying so hard to get back in my good graces he's actually willing to try being Mormon!) but it is over 30 minutes away. Plus, now I've totally re-addicted myself to coffee and we've been drinking a lot of wine. Jerry didn't like wine when we got married, but I consider anyone telling me they don't like wine as a personal invitation to take them to Italy and convert them. That is exactly what I did to Jerry and now we are both loving the Cupcake Malbec. Besides that, I was happy to be back in the Lutheran church. This is the liturgy of my early childhood, and Christmas and Easter never seem quite right without the familiar rituals and chants and hymns. The Lutheran service is a traditional call and response program like the Catholic or Episcopal services, much of it chanted and sung. It is very different from the LDS talks. I get a lot from the talks, but right now I feel the need to return to the elemental. I am happy to report all the angst of the past few months has reduced me another size and I could wear my purple cowl neck dress finally and looked so nice in it that a strange man in the grocery line winked at me when we stopped by after the service! Besides returning to my "home" church, I also returned to an early skill today. When I was very young, like preschool age, my mother taught me to make chocolate. It is one of my best talents to this day. Some of my happiest memories of my mother are of making chocolate together with her. My father's mother started a sorority for the women of the Ohio town where I grew up. My mother, as her daughter-in-law and resident of the town was of course invited to join, and she introduced chocolate fundraisers to the repertoire. One of the things the sisters did was to sell visits from the Easter bunny. The Easter Bunny would come to your house and deliver a basket of chocolate to your child. My mother would make all the chocolate with my and my sister, Sherri's, help and then she was also the pink-costumed Easter Bunny who delivered it. I remember one year she was quite pregnant and we thought the sight of this fecund pink bunny quite funny. We also made chocolate to sell at Christmas. My memories of holidays are always of the smell of the chocolate, and the taste and feel of it, and of opening the sideboard drawers in our dining room to find them stacked full of chocolates. When I was in high school I began making truffles for my most special friends, either as Christmas or Valentine's Day gifts. I am still making them to this day, and as a special gift to my readers I am going to teach you how. First, if you wish to dip the finished truffles in chocolate you will need to temper the chocolate so that it will not cloud or get sticky at room temperature. To temper chocolate is easy, First, take 8 ounces of semi-sweet chocolate and chop it coarsely, or use chocolate chips. Heat your oven to 100 degrees F. Spread the chocolate on a baking sheet. Turn the oven off and place the chocolate in it. Stir every 5 minutes until the chocolate is melted and reaches 100 degrees, 15-20 minutes. Add two 1-ounce squares of well-tempered baking chocolate and fold them in until the melted chocolate reaches 90 degrees. Remove the chocolate squares and save for later use. 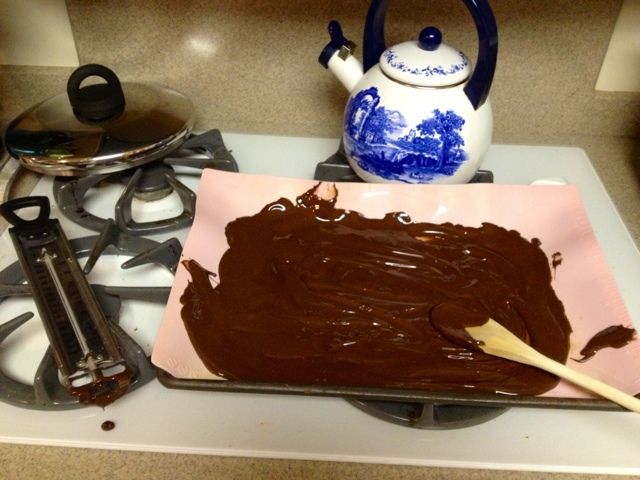 Line a baking sheet with a silicone sheet or waxed paper and spread the chocolate 1/2 inch thick. Refrigerate 3-5 minutes; of the surface is dry to the touch and the center is cool the chocolate is tempered. If not, you must return it to the pan and repeat the process again. Now, to make the truffle filling, take 1 cup heavy cream and heat in a medium saucepan until bubbles form all around the edge. Turn off the heat and add 1/4 cup unsalted butter and 12 ounces semisweet chocolate. 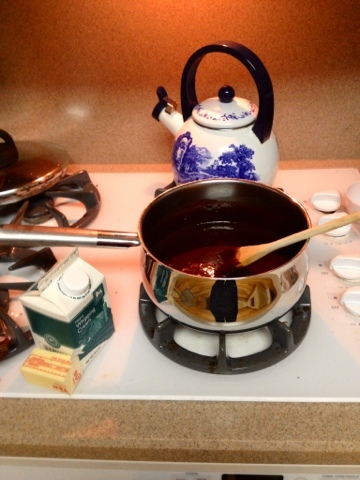 Stir until the butter and chocolate are melted and smooth. You can use this mixture plain as a chocolate filling, or add flavors of your choice. Good flavor options are liqueurs, extracts, spices, or very strong espresso. Today I made Chambord (raspberry) liqueur, Kahlua, Amaretto, and Chai fillings. When you've flavored your mixture, spread it in a cookie sheet and cool for at least 2 hours. When cooled, scoop into 1 inch mounds and roll into balls. You may roll these in confectioners sugar, unsweetened cocoa, nuts, or dip them in chocolate to finish them. For my Chai truffles, I plan to dip them in white chocolate and brush with a tiny bit of nutmeg. The amaretto are always my favorite. If you are European, semisweet chocolate will most likely taste too sweet to you, so you may substitute bittersweet or even unsweetened chocolate and add only the liqueur to sweeten it or stevia or other sweetener to taste. So, there you have my famous truffle recipe. Use it for good! I often dream of opening a chocolate shop. Two of my favorite books are Chocolat, by Joanne Harris, and the sequel, The Girl With No Shadow. Like those stories, people tell me the memory of my truffles will stay with you for many long years. After church today we went to the sporting goods store to get me some new running shoes. My old ones were literally falling off my feet and my knees and feet have been killing me. I finally used the gift card my sister gave me for my birthday (thanks, Leah!) and got myself a really nice pair. Tomorrow I will get up early and finish getting the house ready for company, or at least as ready as it can be with our walk-in attic conversion and bookshelves not yet completed. Then we will eat our traditional Norwegian supper of rømmegrøt (cream porridge) and return to church. I hope you all find peace and joy in your holiday celebrations and fulfillment in the new year. I've finally managed to get some art on the walls. We are a couple weeks in our new home now, and you might have noticed I haven't been writing or selling anything or making anything lately. To be honest, I have just been completely overwhelmed. We've moved the children into their new schools and therapist meetings, unpacked almost everything, and we finally managed to get the Christmas tree up and decorated. But, I have been very slow to start decorating. If you read this blog regularly you might have noticed Jerry and I haven't been on very civil terms since the end of September. In reality, it was worse than I've let on. I have been in a dangerous mood. I am so untethered from my familiar life and my friends, just walking away has seemed possible and maybe easier than staying. I have been extremely fortunate in the possession of a close confidant who knows me inside out and who encouraged me to stay and work things out. So I stayed, but now I am completely estranged from that friend, and through no fault but my own. I miss our talks more than I ever imagined I could. At first the older children seemed to be doing wonderfully well here, but at the end of the second week at school our oldest's principal was on the phone to inform us he hasn't been turning in any homework and is failing math quizzes and tests. So, now we have to figure out what all this is about. He's nearly fourteen, and is as taciturn as a locked door when we try to talk to him. 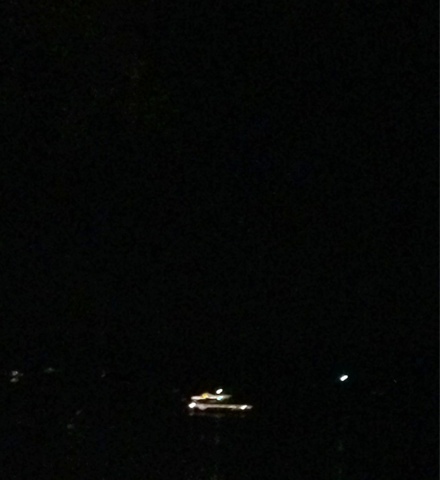 A boat lit up for Christmas tours Lake Norman. I have been feeling so low I have spent more time than I should sleeping and lying around reading Dinesen. I haven't felt like decorating for Christmas or shopping or wrapping presents or decorating or writing. I have been feeling like I'm starting to really lose it, and that worries me. If I learned anything from my early childhood, it is that the one thing you can't do when you're a parent is fall apart. So this week I am trying to get myself together. If there's any upside to all this it is that I work out my problems in my head while I walk and run and I have been running a lot here. I like to run by the lake and see the lights on the water and feel the cold wind, and this area has much steeper hills than I'm used to. Jerry says he thinks I've lost ten pounds since we got here. The other night I saw this boat lit all up on the dark water and I felt as though I was treading water just as black and cold and deep and almost going under. Then it occurred to me that often, when I feel that sad, it means my vitamin D is low again. It wouldn't be surprising; even though we're supposedly in a drought I think the sun has been out only about three days since we got here. It has just been day after day of gray mist and drizzle, and I have a terrible time keeping my levels up even in midsummer. I decided I'd better eat more fish. I prefer smoked fish, as you all know, but my mom and grandfather loved canned red salmon best. I love that too, and my favorite part is the bones and skin in the center. The bones are soft, like Smarties candy, and they're good. As a girl I had to fight my sisters for the bones, but since I am now the cook I very selfishly remove the bones and eat them myself! I must be raising real Norwegian Chinese kids, though, because the other day I opened a can of salmon and extracted the vertebrae and was all set to eat them up when my youngest came in and begged roughly half of them away! So I'm eating my fish, and Jerry and I have talked a lot more than we have for years, and I hope we are turning a corner now to better times. This is a beautiful place and a lovely house. I decided to start decorating. Jerry has two weeks off, so he is here to help me. Yesterday and today we hung three gallery walls of photographs and art. We chose the front hallway for the black and white gallery. Fifteen years ago Jerry brought the giant Marilyn Monroe poster to the marriage and I've been decorating around it ever since. I hated it at first, but she's grown on me. For one thing, every one of the children has pointed to that poster at one point or another and said, "That's you, Mom." And I always say, "Why yes, you're right. It is!" And I started collecting black and white pieces to blend it in. The small photo on the bottom of the flying machine was exhibited at the NC Museum of Art years ago in the Defying Gravity exhibit; probably around 2003 or so. I loved that piece so much I took it from the catalogue and framed it. Unfortunately, I have lost track of the name of the artist. Any information from my helpful readers would be much appreciated. I would love to give proper credit. 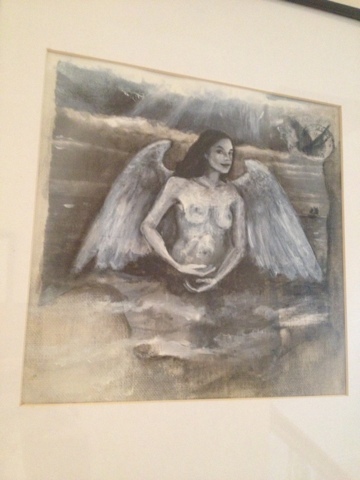 Siren, a mixed media painting. Then this piece is one of my own, a mixed media piece depicting the Lorelei, called Siren. I created this piece as an illustration for a CD called one by the Loreleis of UNC, the a capella singing group. I love this piece because it was one of those rare paintings that just work out immediately from the minute you begin to work, as if they are ordained. I love the feeling of uncovering, rather than creating, art. It is as if the piece already exists and I am just revealing it. It is a rare occurrence, at least in my artistic life! Hanging this piece, remembering that feeling, and reading my Dinesen again brought the past up bright before me. Jerry and I have talked a lot about the past this week, and the people we once were. We met so young, at 14, and were engaged at 21 and married at 23. In many ways, we wish we could return to the people we were at certain times. It is the siren song of the past. It always seems better in retrospect than it did at the time. There are particular parts of myself I do wish I could recover. I used to paint or draw every single day. I almost never do now. Reading Babette's Feast again (this is a Isak Dinesen short story I very highly recommend) I see the lines I highlighted when I first read and re-read it at University and as a young wife. I underlined this: "A great artist...is never poor. We have something...of which other people know nothing." I was very, very poor at the time, but I didn't feel it much, because I felt like I would go so far and that my life was so rich in experience. Lately, I have wondered if what we have gained materially is worth all we lost or traded as we aged. I hope we can go back and pick up the best parts of our younger selves to bring along to our new life. 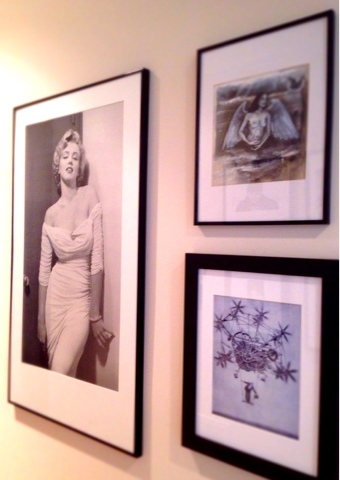 So, I hang the art and photos, and I decorate. Today Jerry accompanied me to Mary Jo's Cloth Store in Gastonia. This fabric store is famous all over for its amazing selection, and now I am privileged enough to be only 28 miles away. 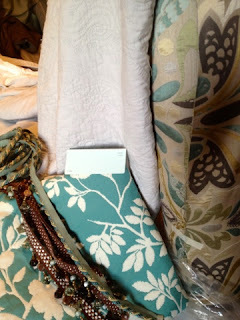 I poured over the fabrics for hours trying to decide what to do with our master bedroom. All I can do is hope, and keep putting one foot in front of another, and I am thankful to have company along my way. This fabric was my favorite at Mary Jo's.